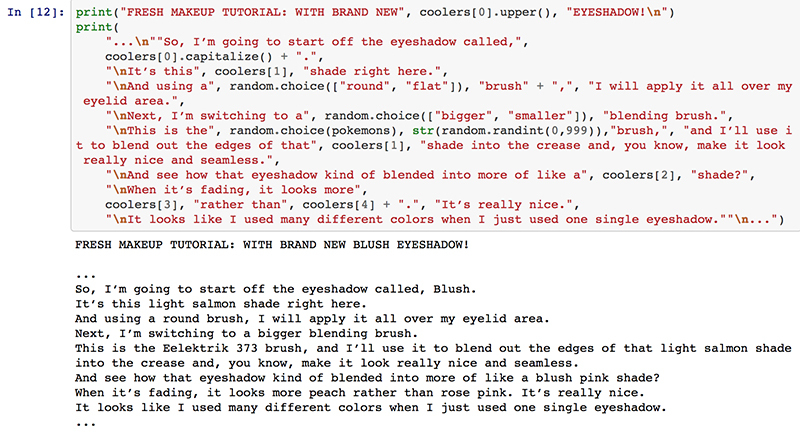 A makeup tutorial generator using xkcd color vectors. Original text is from one of the tutorials in Deck of Scarlet. In order to generate makeup tutorial, I used two data resources from Corpora: xkcd color data for shadow colors, and Pokemon name list for the brand name of shadow brush. Because the part that is most actively using color vocabulary in many makeup tutorials is where the person applies shadow, I'll pick the part that she introduces this awesome shadow product - and collect 6 similar colors to it (there's some integer typo in the screenshots; it should be 6, not 10). FRESH MAKEUP TUTORIAL: WITH BRAND NEW SOFT BLUE EYESHADOW! So, I’m going to start off the eyeshadow called, Soft blue. It’s this lavender blue shade right here. And using a flat brush, I will apply it all over my eyelid area. Next, I’m switching to a smaller blending brush. This is the Pansage 708 brush, and I’ll use it to blend out the edges of that periwinkle shade into the crease and, you know, make it look really nice and seamless. And see how that eyeshadow kind of blended into more of like a cornflower blue shade? When it’s fading, it looks more perrywinkle rather than dodger blue. It’s really nice. It looks like I used many different colors when I just used one single eyeshadow.